Abstract: Bacteriophage (phage), or bacterial viruses, have been exploited for “phage display”, the engineered expression of a peptide of interest fused to the coat protein of a tolerant phage. The lytic phage λ has effective phage display capability which we have previously exploited to construct a tuneable peptide display platform for superior fusion tolerance and functionality. 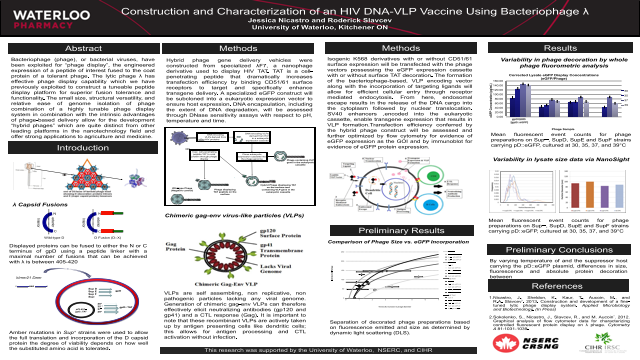 Hybrid phage gene delivery vehicles were constructed from specialized λF7, a nanophage derivative used to display HIV TAT. TAT is a cell-penetrating peptide that dramatically increases transfection efficiency by binding CD51/61 surface receptors to target and specifically enhance transgene delivery. A specialized eGFP construct was subcloned into a eukaryotic expression vector to ensure mammalian host expression. DNA encapsulation, including the the extent of DNA degradation, was assessed through DNase sensitivity assays with respect to pH, temperature and time. Isogenic K568 derivatives with or without CD51/61 surface expression will be transfected with the phage vectors possessing the eGFP expression cassette with or without surface TAT decoration. Transfection efficiency conferred by the hybrid phage construct will be assessed and further optimized by flow cytometry for evidence of eGFP expression as the GOI and by immunoblot for evidence of eGFP protein expression.